Water, fire, earth, air, wood, space, metal/minerals, nature, consciousness – all examples of elements, and their variants, that have been embraced in various combinations by cultures around the world. The elements connect us all. Publishing my first post on March 1st 2014 was an exciting and somewhat daunting experience. Here I was, sharing my passion for the elements with a world-wide audience. There was so much to write about – would anyone be interested? The answer is yes. So far nearly 10,000 people have visited my blog and close to 15,000 have viewed my posts (based on the statistics WordPress provide). For that I am most grateful. I would also like to thank my dear sister who has commented on all of my posts. It is uplifting to get feedback, especially thoughtful comments like Ruth makes. FireupWaterdown has reached a global audience, as intended. Viewers from 141 countries have visited the site over the last three years. It is pleasing that the top ten viewing countries span the Americas, Canada, Europe, Australia, Southeast Asia, Japan and India. 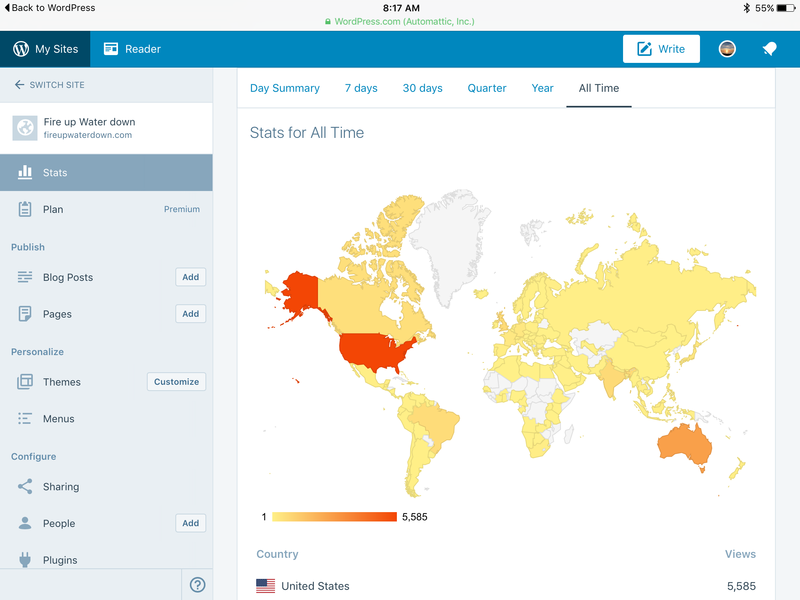 The map below shows that no one in Madagascar has viewed my posts. I hope to change that in the years ahead in addition to other places yet to be reached. A map of the countries that viewers of FireupWaterdown have come from over the last three years. Most of them are from the USA, followed by Australia and India. I am sure there is much more to glean from the statistics WordPress provide. This is a good start though. One of the posts I would like to highlight that I feel deserves a wider audience (don’t all bloggers say that?!) is about the element ‘Air’. The post I wrote was based on a book written in 1963 titled ‘What is Air?’. It is much, much more than what we breath. I had expected that people would search for ‘what is air?’, just as they search for material on the elements of fire and water. It seems that air is not as high up in people’s minds. To change this imbalance I invite you to read the post and be in awe of this essential element. 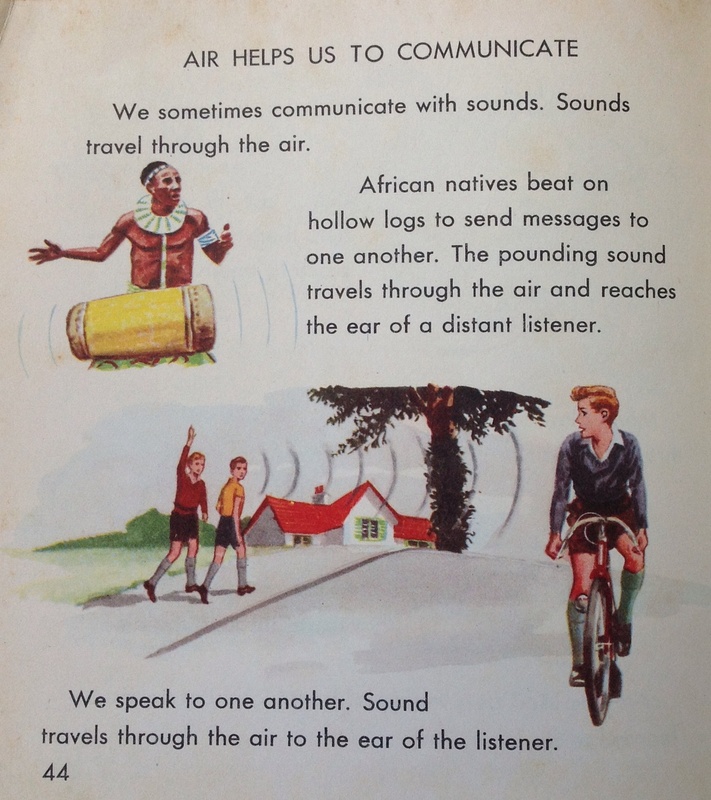 An example of one of the many attributes of air – it’s essential role in helping us communicate. The lovely watercolour illustrations and text are from the book ‘What is Air?’ (Collins, 1963). On the other end of the scale is my most popular post, by far. Titled ‘The elements at your fingertips‘ it has been viewed by almost 1800 people (and counting). This post was written four months after I began my blogging journey. It goes to show that older posts do not always get lost. That was something I thought could happen. 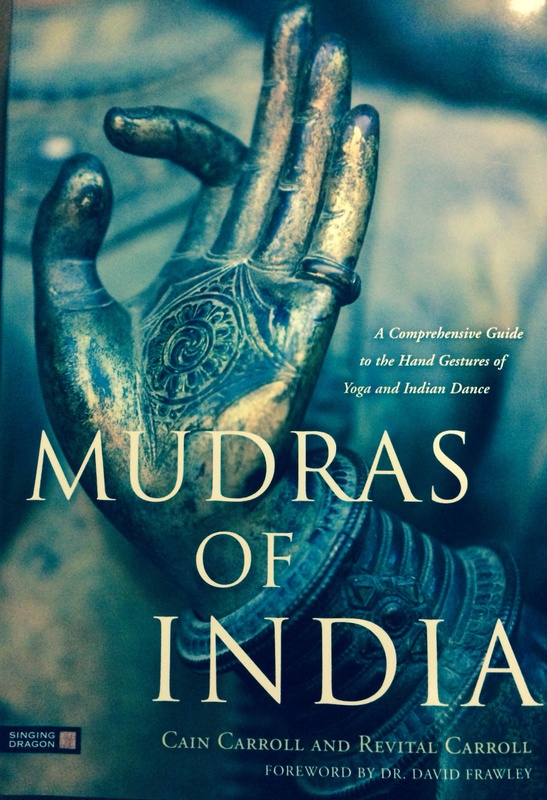 My most viewed post focuses on mudras, the elegant and powerful hand gestures often associated with Buddhism, yoga and Indian dance. It discusses the relationship between the five fingers and the five elements in India, China and Japan. As I said at the start of the fingertip post, having learnt about mudras I will never look at my hands the same way again. Considering how many visitors have viewed the post on mudras, it is perhaps a surprise that my post on the broader Indian philosophies related to the five elements has only been viewed by 62 people (based on WordPress statistics). Written in May 2014, the title of the post is ‘Praktri, an integrated vision from India‘. My presumption is that Praktri, which translates from Sanskrit as ‘nature’ or ‘matter’ is not a common search term amongst English speakers. As the post reveals, the five elements are deeply embedded in Indian culture. It’s a place I plan to visit one day. Once you learn about the pervasiveness of the elements in our lives, both physical and philosophical, you never look at the world the same way again. 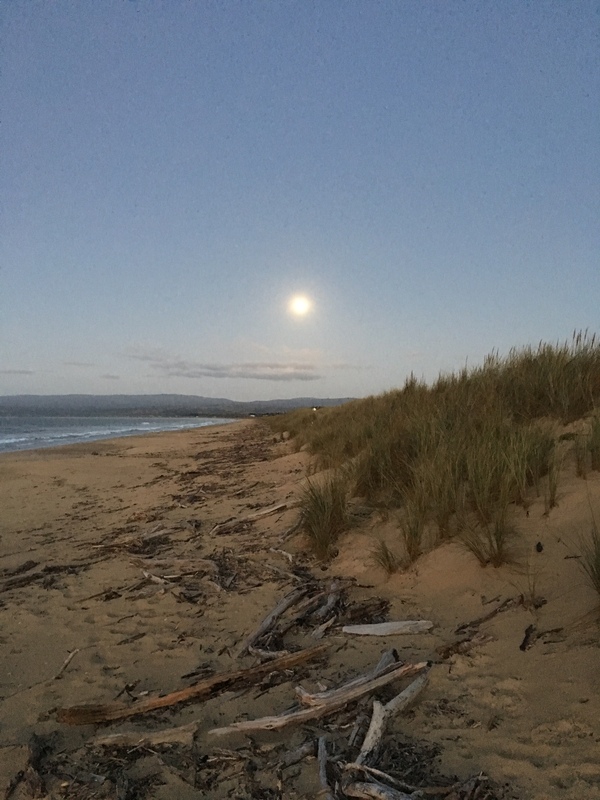 The 75 blogs I have written so far introduce readers to the depth and breadth of the elements across cultures, space and time. There is so much more to explore. I would welcome any topics people would like to see covered. An example of a blog that arose from a request was my recent coverage of the five elements of the Dagara tribe in Africa. Late last year I was approached by Rych Somdah who reminded me of my intention to write about the shamanistic practices of the Dagara. His prompting stimulated me to write about a different set of elements, also five in number. You can read more about them here. A Medicine Wheel is the basis of the cosmology and five element rituals of the Dagara. 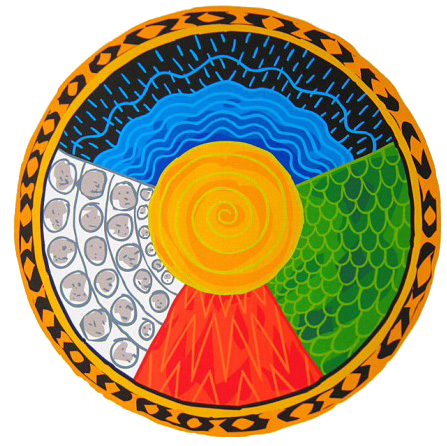 The five elements are Fire (red), Water (blue), Earth (yellow), Mineral (white) and Nature (Green). The elements have related colours and directions. These associations are found in other elemental frameworks such as the Wu Xing from China. Source: malidoma.com (apart from the part about China). The discovery of new interpretations and applications of the elements continues to excite me. Just today a friend sent me a link on Facebook to ‘elemelons’. 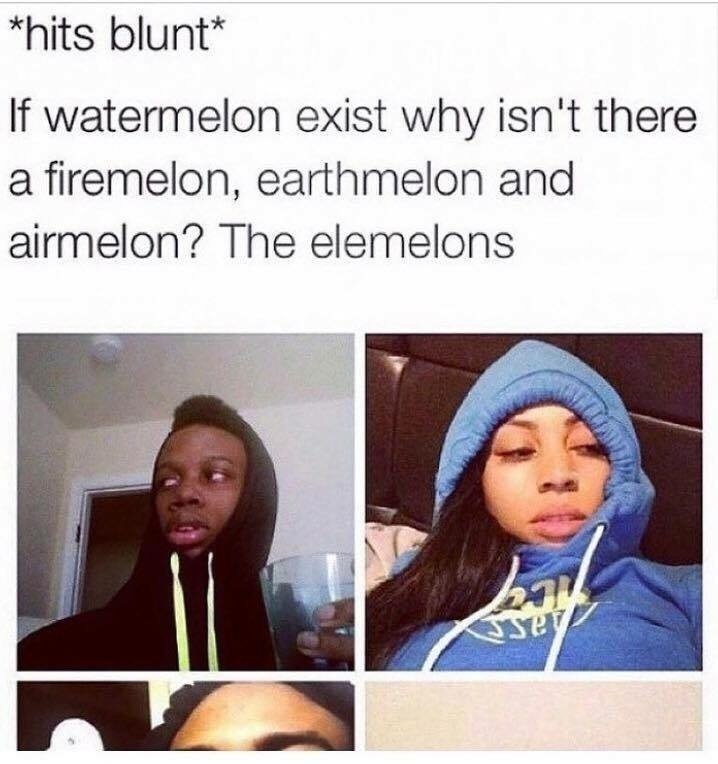 On January 13th this year Cheech and Chong had asked the following question on their Facebook site “If watermelon exists why isn’t there a firemelon, earthmelon and airmelon? Hence the ‘elemelons’. This is a good example of the elements appearing in popular culture. As of today, there have been 19,300 people who ‘liked’ this blog post and 2,900 comments. I have some way to go to reach that level of response! The quote and accompanying pictures from the Cheech and Chong Facebook site. Elemelons, I like the idea! The concept is similar, in a way, to Elementals – mythological beings associated with the elements of water, fire, earth and air. That is a subject I have written about in my post ‘Welcome to the world(s) of Elementals‘. Writing about the elements and the way they connect us is very satisfying. Because of the massive scope of the subject it is only possible to touch the surface of each topic. My hope in doing so is that each post will stimulate readers to search for more information. As I discovered the extent of the elemental story, I developed a yearning to focus in more detail on one expression of the elements. That focus is Japan. In May 2016 I started an informal sister blog called ‘Elemental Japan’ (see https://elementaljapan.com) that shares the story of my exploration of the elements in this beautiful and intriguing country. The first three years writing about the many and varied ways the elements are expressed across the planet has been an amazing journey. They have inspired me to declare 2017 as the year of the elements. The elements are an embodiment of energy, they are part of us and all around us. I will be searching for and sharing stories about them for some time to come. This entry was posted in Africa, Air, Australia, Europe, India, Japan, Story telling, The five elements, USA and tagged Africa, Air, Buddhism, China, Fire and Water, India, Japan, the elements, Wu Xing. Bookmark the permalink. Thanks John. Your blog Green Shinto provides me inspiration. I enjoy it very much. I would also like to acknowledge the comments you have made on FireupWaterdown over the last three years – after my sister Ruth, you are the top commenter. So you get the non-family member award! Originally I was planning to write one post a week, which would have bought the tally to 150 by now. Because each contribution takes me some time to write, and due to the challenges the universe puts in our path, I only managed half that number. There is no rush. I will continue to research, experience and share the elemental stories that are waiting to be told. 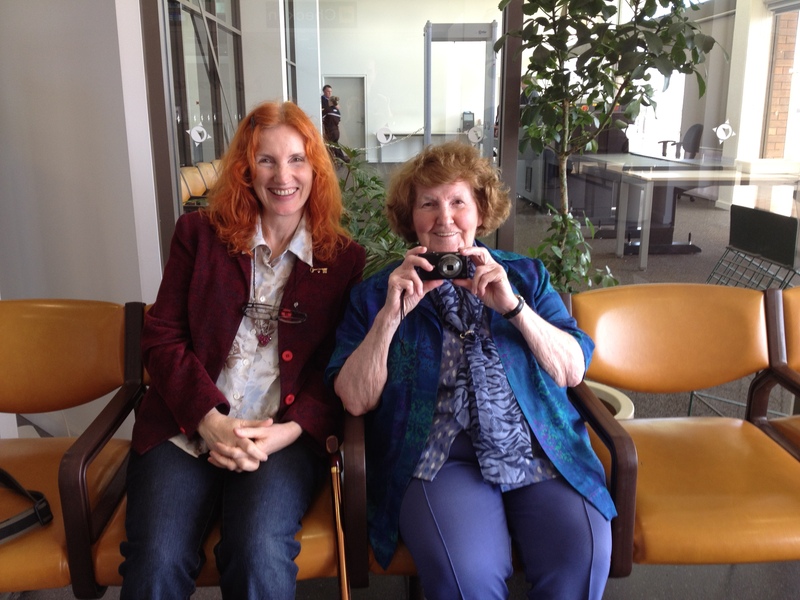 Your writings Jann are always of major interest – I continually learn things for which I’m grateful. I would also like to learn more about “light” – would that come into the area of “air”? the special light that artists and photographer’s notice…which is so fleeting in time too, so very special … to actually stop driving and snap a picture at THAT moment or two. Unpolluted fresh air – with the sun lighting at just the right time. Thanks Gaylene. I am pleased that there are lessons to be learnt from my posts. Comments like these make it all worth while. “Light” is of great interest to me as well. I’ve been intending to write a post called “Of light and shadow” for a while now in my sister blog elementaljapan.com. This was one of the themes that struck me on my most recent visit to Japan. Intuitively light would be connected to the element of air. A book I recently found titled ‘Natural Healing Through Ayurveda‘ noted however that the essential qualities of light and colour were related to the element of fire. The element of air was related to touch. These fascinating relationships are ones that I will have to explore further to uncover their deeper meaning. Once again, thank-you for your continued interest and support.